Section Collandra includes species generally with only moderately bilabiate corollas and stems that grow horizontally, with strongly anisophyllous leaves. Anisophylly refers to the production of leaf pairs where one member of the pair is much larger than the other. In some cases, the smaller leaf all but disappears with the result that the leaves appear alternate. C. eburnea nicely illustrates this phenomenon. Most species in this section were included in the Wiehler genus Dalbergaria. Columnea medicinalis is one interesting species in this diverse and species-rich section, and is characterized by dense clusters of bracts that almost fully enclose the flowers (which explains its older name, Columnea densibracteata). This section is the most poorly known since some species seem to be widespread and variable, whereas others are restricted to small geographic areas. Much work still needs to be done to resolve the taxonomy and species delimitations within this section. 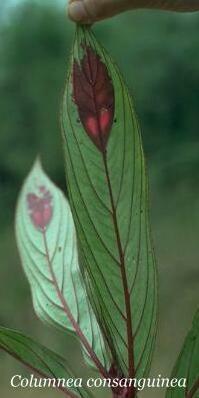 Species that are placed here all have strongly anisophyllous leaves that often have spots, red “windowpanes”, margins, leaftips or even the entire underside of the leaf brightly colored in red or purple. By contrast many of the corollas in this section are less brightly colored, often yellow or even a translucent white. 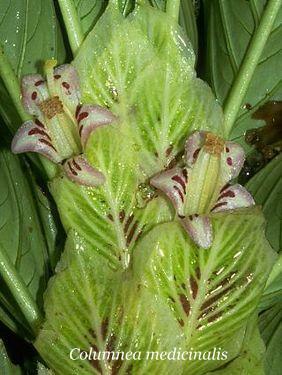 The dense and large bracts that often obscure the flower are also common to this section.